We were all just talking and getting to know each other on a personal level and next thing we know its time for bed. So brendon shows Josh and Tyler where they sleep. There are two bunk beds right across each other. On the top its me and on the bottom its josh, then on the top of the other one its Brendon and Tyler under him. We get in bed and  close our curtains and try and fall asleep. But from all of this excitement I cant sleep, so I sit in my bed for an hour till I decide to get up and get a glass of water to try and help. But when I get the glass I feel a hand touch my shoulder and I jump and drop the glass, luckily it doesn&apos;t break. I turn around and its brendon. He hugs me tight trying to calm me down. "Hey, what are you doing up?" he whispers to me. "I couldn&apos;t sleep, what about you?" I ask. "Same" He says as he cups my cheeks and we stare deeply into each others eyes and slowly move closer until we are interrupted by Josh and I jump back and fall on the couch. They both look at me and chuckle. " what are you two doing? You should be in bed" Josh says. All I can do is blush and sit frozen on the couch. &apos;was he really gonna kiss me?&apos; I keep thinking. "We couldn&apos;t sleep." Brendon says. "Brendon, your gonna keep her up even more. Now the thought of you about to kiss her is gonna be in her head all night!" Josh says smirking at me. 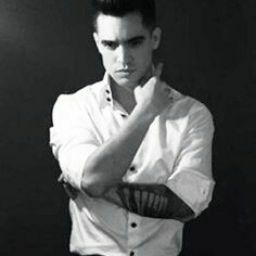 "I-I j-just c-" Brendon stuttered but was cut off when I put my hands around his waist hugging him from behind. 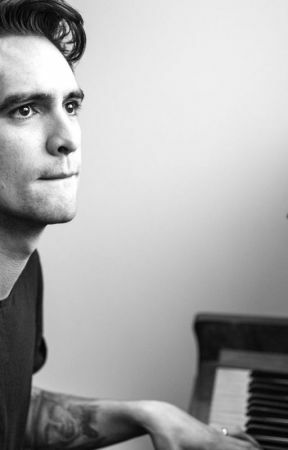 "I-its ok Brendon. Y-you don&apos;t have to explain to josh, you can explain it to me later" I said as I walked back to bed and closed the curtain. Josh and Brendon talked for a second before they whet back to bed but before I knew it Brendon had opened my curtain a bit to talk. "I still cant sleep" He said. "Me neither" I responded. "I know what I need to fall asleep" He said again. "What?" I asked "This"
He slowly cupped my face again and he planted a small quick kiss to my lip and I squealed and blushed like crazy. Josh was still awake and when he heard me he punched Brendon in his...you know where spot. Brendon fell to the ground making a big thud and josh started cracking up laughing. I jumped off my bunk and hit josh in the arm and I sat next to Brendon. "B-Brendon, A-are you o-ok?" I asked rubbing Brendon&apos;s back slightly. " I-Ill b-e ok" He said and sat up. By now Tyler had woken up and asked what happened and before me and Brendon could say anything josh jumped in. "Beebo kissed (Y/N) and I punched him in his no no spot. " Tyler started laughing like crazy and I seemed to be the only one who cared. I helped Brendon to the couch and I got him an ice pack. I sat on the couch and Brendon layed his head on my lap putting the ice on the spot he got punched. I was still blushing like crazy from the kiss. &apos;Did he really feel that way about me?&apos; I kept thinking. Josh and Tyler walked into the room with us. "Wow beebo, I didn&apos;t know you felt that way about a fan" Tyler says winking at me making me blush more. "U-uh " is all Brendon could say while he blushed. I was going crazy. "y-you guys should g-get some sleep, ill stay h-here with Brendon" I say to Tyler and Josh. They agree and go back to bed as Brendon falls asleep on my lap and I end up falling asleep to. When I woke up and I was in my bed. was last night just a dream? I opened my curtain and Tyler, Josh, and Brendon were all gone. I got out of bed an I saw them all sitting on the couch playing video games. I smiled and grabbed some new clothes and walked into the bathroom. I changed into my P!ATD tank top and some ripped black skinny jeans and I was wearing my Panic dog tag. When I was done in the bathroom I walked out to where the boys were and they all just kept paying attention to their game. Brendon, being so cute, was getting mad at Josh who kept beating him. I walked over and set my hand on Brendon&apos;s shoulder. He turned around and seemed shocked. "Oh, (Y/N), did we wake you?" Tyler  asked. "No, I woke up on my own" I said. "how&apos;s your neck? This couch can give bad kinks in your neck sometimes" Brendon asked. &apos;So last night did happen, Brendon actually kissed me!&apos; I thought to myself. "Oh! I-im fine. I mean, still kinda shocked all this is happening to me but yeah." I said. Brendon got up and gave me another quick peck on the lips. I blushed and hugged him and sat down next to Tyler.